After my post yesterday about the MJ collection presented at NY, I decided it was time to enagage in some further dwelling upon Stephen Jones. It was clear even before I visited the site that Ascot was pure child's play. 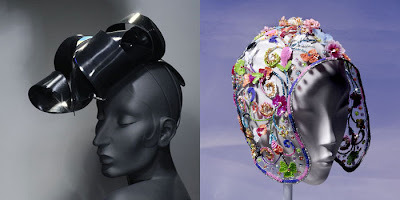 But no wonder, a great deal of the finest couture hats that can be seen there come directly from his workshops. So who is Jones anyway? According to the bio on the site, he was born in Chesire and attended school in Liverpool. Only to make his entrance on to the London fashion scene in the late seventies. He was a student at St. Martin's by day, but after dark he was one of that era's uncompromising style-blazers at the legendary Blitz nightclub - always exquisitely dressed, and always crowned with a striking hat of his own idiosyncratic design. 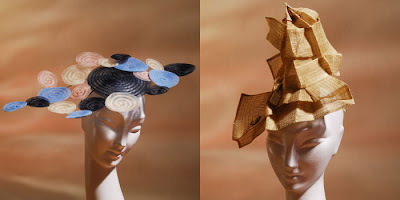 The first millinery salon opened its doors by 1980, in the heart of London's Covent Garden. Every great personality, be it a rock star or Lady Diana, all reffered to his services. 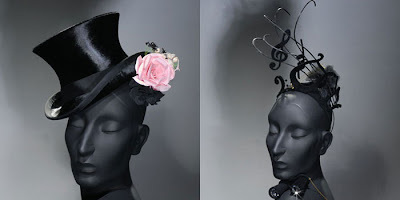 His hats were worn by models on possibly every important fashion show on the earth. Only to name a handful: Rei Kawakubo, Vivienne Westwood, Thierry Mugler, Jean-Paul Gaultier. Word is that a fragrance signed Stephen Jones and Rei Kawakubo is due to be released this month. This is what Jones said about it: Fragrance and hats are ephemeral and romantic. It's the same mentality - almost more so than hats and fashion. I'm a tiny little company and I needed somebody who would be into what I'm doing. I did all the sketches and Rei approved them and said, 'Left a bit, right a bit'. Plus, the fragrance is described as futuristic, but rococo, being a sultry, heady combination of violet, clove, carnation and rose, in a typically decadent bottle. It will be launched during the upcoming London Fashion Week. I'd be more than glad to add more about this incredible creator, but I was quite overwhelmed by the CV page. It's so impressive and contains so many famous names I couldn't tell who to begin with. You should definitely lay your eyes on it, it's truly fascinating. these are some enviable pieces! I'm a bit addicted to perfume bottles and this one is gorgeous.